New Zealand’s southermost region combines wild scenery, a relaxed lifestyle, and the country’s most affordable housing. Southland’s capital and only city, Invercargill, boasts a charming architecture (50,000 inhabitants) and unique Scottish heritage. Wages are on the high national average and houses are relatively cheap, making this overall sparsely populated region a judicious choice for young families. The rough terrain and weather conditions made it difficult for Māori to establish, and very few villages existed when the first Europeans visited the region. Ironically, the latter started roaming about the coastline as early as the late 18th century, due to the abundance of seals and whales. The mid-1850s marked the creation of the first settlements, now known as Invercargill and Bluff. Gold mining further north added to these towns’ prosperity. Sheep and dairy farming then developed and are still nowadays a major industry and source of income for the region. Because the vast majority of European settlers were from Scotland and most of their descendants still populate the region, the heritage lives on in the form of locals softly rolling their ‘r’s. If Invercargill is home to half the region’s population and has all necessary amenities (including a popular Institute of Technology and quality sporting facilities), less urban areas can get fairly remote and wild. 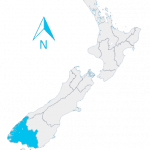 Southland’s geography has two distinct landscapes: the south-south-west rugged coastline, inlets, lakes and mountains form dramatic Fiordland. The country’s biggest and –arguably wildest– National Park attracts thousands of visitors every year, adding up to 1/4 of the New Zealand’s tourism income. Further east/south-east, farmland and rivers lay beyond Invercargill and the Catlins’ coastline. Three climates can be distinguished within the region: mild on the coasts, bigger extremes further inland, and wet around the Fiordland area. Invercargill can be fairly windy and usually records mild temperatures, around 10-20C in summer and around 5C in winter, with very long daylight hours in summer and rather short ones in winter. Southland has many cards to play on the employment scene. A large farming/dairy industry –and the world’s biggest raw milk processing plant– means opportunities in this sector. Fishing and forestry opportunities are comparably to the national average but promising Southland jobs can be found in the energy sector. Coal and hydroelectric power play a major card in the region’s employment and potentially very large oil and gas reserve are available offshore in the Great South Basin, with drillings taking place since 1960 and recent explorations more and more promising. Last but not least, Fiordland sees tourists flock from all over the world to visit the country’s most remote and wildly beautiful landscapes. Boating, fishing, kayaking, diving, tramping are only a few of the popular tours offered in the region.